The moon highlights the beach as swarming masses of horseshoe crabs crawl ashore to lay eggs, as they've done for millions of years during spring and summer high tides. The horseshoe crab is one of the few species that remain nearly unchanged from their 400-million-year-old ancestors. While its nearest arthropod relatives are extinct, members of the Arachnida family thrive in the modern world. The horseshoe crab is one of the living fossils of the earth, surviving three mass extinctions that wiped out nearly all marine and land animals. Four horseshoe crab species exist today: the North American species, Limulus polyphemus, and three species along the Asian shores of the Pacific Ocean, Tachypleus tridentatus, Tachypleus gigas and Carcinoscorpius rotundicauda. The North American horseshoe crab is a valuable resource, as its unusual blue blood is copper-based instead of iron-based like most animals. The horseshoe crab's blood is used to test the purity of drugs because it clots when exposed to toxins produced by any contaminating bacteria. 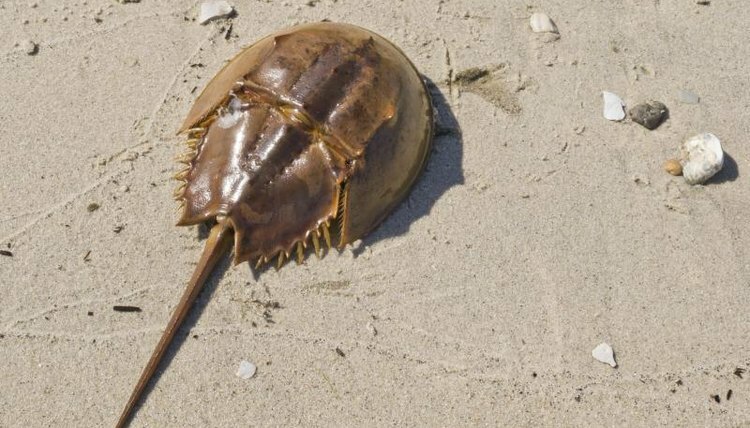 Due to harvesting by humans for medical purposes, research, animal food and bait, the North American horseshoe crab is considered near-threatened by the International Union for Conservation of Nature and Natural Resources. The horseshoe crab's closest relative are extinct -- not surprising when you consider that horseshoe crabs were crawling over the shallow sea bottom over 400 million years ago. Sea scorpions (Eurypterid spp.) ranged in size from nearly 4 inches long to 6 feet long. These predators were among those who perished in the mass extinction that led to the rise of the dinosaurs approximately 251 million years ago. While the sea scorpions lived in the shallow seas and may have crawled onto land, the horseshoe crab's nearest relatives during the prehistoric era were also sea dwellers, the trilobites (Trilobita spp.). The trilobites appeared approximately 520 million years ago and thrived for about 250 million years before dying out during the mass extinction, with the last few species disappearing approximately 245 million years ago. The closest modern relatives of horseshoe crabs include scorpions, which are arachnids. Scorpions began migrating from the oceans to land approximately 420 million years ago, which may be one reason why scorpions survived the mass extinction that killed 96 percent of all marine life. These venomous carnivores are found on every continent except Antarctica. At least 1,700 species of scorpions exist in 17 families; 40 scorpion species are native to North America. The most venomous U.S. species is the bark scorpion (Centruroides exilicauda), found in southwestern New Mexico, Arizona, southeastern California and Mexico. The largest modern scorpion is the flat rock scorpion (Hadogenes troglodytes), native to southern Africa. Popular in the pet trade, the flat rock grows up to just over 8 inches long. While all scorpions are poisonous, only a few produce venom dangerous to humans -- although there is risk of severe allergic reaction, similar to bee sting allergy. Spiders are the largest group of arachnids in the world. More than 50,000 spider species thrive around the world, ranging in size from the 12-inch-long goliath birdeater tarantula (Theraphosa blondi) of South America down to the miniscule Colombian Patu digua at less than 1/64 inch. Spiders may live in webs or along the ground or in trees, but all are predators, catching and eating pests. Only a few species are dangerous to humans, including the recluse spiders (Loxosceles spp. ), the widows (Latrodectus spp.) and the hobos (Tegenaria spp.). Like the horseshoe crabs and scorpions, spiders evolved around 400 million years ago. Among other relatives of the horseshoe crabs are mites and ticks. More than 48,000 species of mites and ticks exist, including the American dog tick (Dermacentor variabilis) and the Rocky Mountain wood tick (Dermacentor andersoni). Ticks are blood-sucking parasites that latch onto passing animals. Mites are similarly parasitic, surviving on blood or plant juices. Many mites that infest humans are microscopic, such as the hair follicle mite (Demodex folliculorum) and scabies mite (Sarcoptes scabiei). Plant-sucking mites include the twospotted spider mite (Tetranychus urticae) and the clover mite (Bryobia praetiosa). Like the horseshoe crab's, the fossil histories of mites and ticks go back approximately 400 million years. University of California Museum of Paleontology: Eurypterida "Sea Scorpions"